I am so excited to share with you today’s post, as it’s all about the bridal box I recently received from The Wedding Box. The Wedding Box is an etsy store which sells boxes for lots of different members of the wedding party. From mother of the bride, to the bridesmaids, the mother of the groom, and even the hen do; not forgetting one for the bride herself! The ‘Bride-To-Be’ box is the one I shall be reviewing today, and The Wedding Box Co were lovely enough to send me this box at a discounted price, in exchange for this review! First thing’s first, there was a little issue with me receiving this box, in that even though it clearly was labelled ‘fragile’, the courier service did not handle with care, therefore much of the outside of the box, and the ‘Mrs Hindson’ message was also damaged. I alerted the company about this issue because, although I know it was no fault of theirs whatsoever, I felt I had to as I was opening the box on my Instagram story and it was very clearly damaged. However, the company were absolutely lovely about this, and even re-sent me the message framed! I was completely honoured by this gesture, as I did not hold this company liable for the damage whatsoever, and this kind gesture really made my day! A Small Bottle Of Rose, Complete with cute straw! I’m going to review each of these items individually, and then summarise with an overall review at the end, as I’d really like to give this box the detail it deserves! I loved the idea of a face mask within the box, and I also love that this one is from superdrug, therefore is cruelty free and suitable for vegans. This means it really caters for everyone, which I appreciate! However, unfortunately, I could not use this specific item as it contains aloe vera. I maybe should’ve alerted the company of this allergy when I ordered, so place no blame on them for this, but this does mean I don’t have a first hand experience with this mask. My fiancé offered to be my guinea pig though, so tested out the mask for me and he really loved it! The wedding themed DVD is a genius addition to the box! From my understanding of how the boxes work, each box contains a different DVD which is wedding themed. 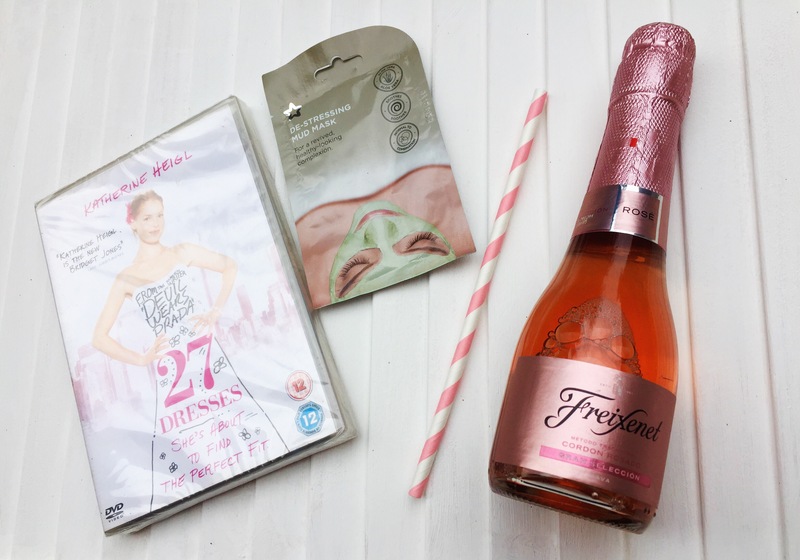 The one in mine was ’27 Dresses’ which is one of my favourite rom-coms, and perfect for those de-stress, pamper evenings that we all need every now and then! The ‘Save The Date’ plaque is my favourite item in the box! It’s just so pretty, and I cannot wait to write our date on this and hang it in the house! I was really pleased that the pouch of confetti contains dried petals. I much prefer this style to the plastic/paper styles of confetti, and the one included in this box is really pretty! And, oh my gosh, the bracelet is so adorable! I love the string style of the bracelet with the little heart charm, and I love wearing lots of bracelets in the summer time, so I know this one will be worn a lot! A cute little addition to this is the definition of ‘bride-to-be’ on which the bracelet is mounted, this is a really nice touch that I can really appreciate as a linguist. And last, but certainly not least, is the little bottle of rose! Again, from what I understand, flavours etc vary box to box, but a small bottle of alcohol is included, complete with a cute pink striped straw! Rose is actually my favourite wine, so I am definitely looking forward to having a nice glass of this, in front of the TV watching ’27 Dresses’, with the candle burning. Overall, I absolutely love this box! 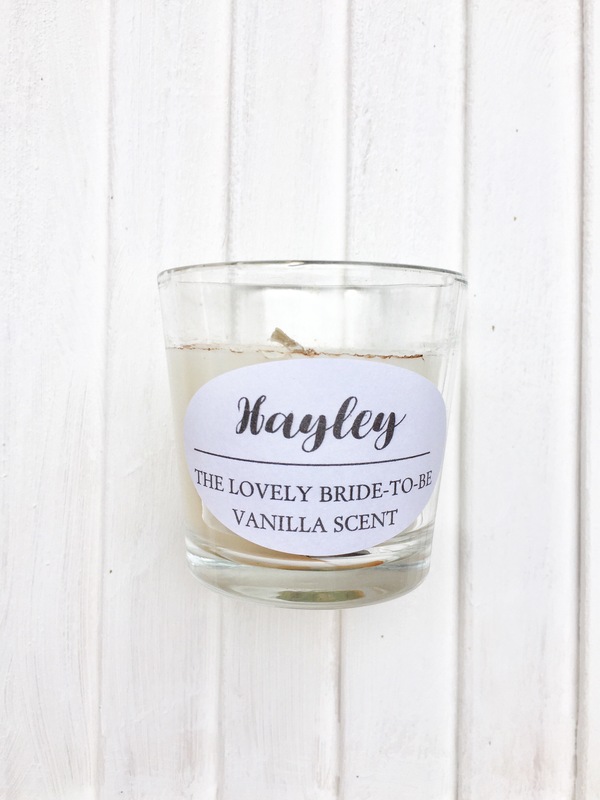 I think it is the perfect gift for a stressed out bride-to-be the week before the wedding, as it certainly encourages relaxation. 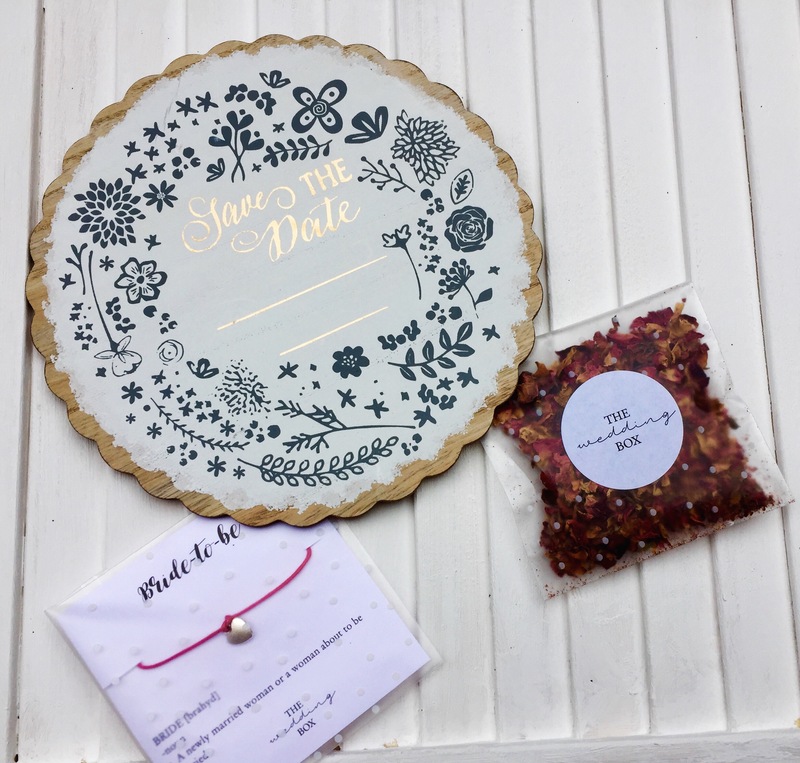 There’s also some really lovely keep sakes such as the plaque and the bracelet, and I’m so glad I decided to collaborate with The Wedding Box on this post! This box is priced at £30, which I do not think is too bad considering the amount of thought and effort that clearly goes into each and every one. I’m already looking at the mother of the bride box, and the bridesmaids boxes for my big day! In fact, I’m secretly wishing that they bring out a ‘Groom-To-Be’ box as I just know that Z would love it! Thank you for reading this post! Are you planning a wedding soon? What do you think of these boxes? Visit The Wedding Box’s store HERE. *Product sent at a discounted price in exchange for review. This is the cutest box ever! Such a great idea for brides to be and their bridal party! Such a shame that the frame broke but amazing costumer service from the company indeed! Can’t wait to read more about each product! This is such a great idea for the bridal party. That’s really great customer service too! Awww what a lovely idea! It seems as though tonnes of effort is put in to these lovely little boxes; I wish I’d known about them when my sisters were getting married! Although, I’d definitely want “Father of the Bride’ as my wedding themed DVD – my favourite wedding-themed film! Lovely photos and glad you enjoyed all the treats in the box! Would love a box like this if I was a bride to be! Make the most of it chick & pamper yourself as much as possible! I was so impressed by all the goodies from this box when I saw you unboxing it on Instagram! It sounds like a fantastic deal and you get so many cute surprises! This would be a great gift for a newly engaged friend! The Save the Date plaque is indeed gorgeous, not surprised it’s your fave item! It’ll be a lovely keepsake to remind you of your wedding in years to come as well! They definitely need to make a Groom to Be box too, what a fab idea!! Wow this box is gorgeous! I love all the products inside, the candle looks lovely and the bracelet is so cute! Pity about the box getting damages the first time but it was so kind of the company to send the framed version of the note! Next Post Cooking with 'One Pound Meals' by Miguel Barclay!